Golimumab as an IV infusion was first FDA approved in 2013, in combination with methotrexate, for the treatment of adults with moderately to severely active rheumatoid arthritis.6 A once-monthly subcutaneous injection of golimumab was initially approved for rheumatoid arthritis in 2009. The primary efficacy measure was the percentage of patients who achieved a 20% improvement across specific measures assessing overall function, pain, and inflammation, according to the Assessment in Ankylosing Spondylitis (ASAS20) response criteria at week 16. The FDA approval of 2 new indications for golimu­mab IV infusion provides a new treatment option for appropriate patients with psoriatic arthritis or ankylosing spondylitis. In clinical trials, golimumab, a fully human TNF-α blocker, demonstrated reduced joint symptoms and structural damage compared with placebo in patients with psoriatic arthritis, as well as reduced symptoms and disease activity in patients with ankylosing spondylitis. Golimumab may provide certain patients the option of an alternative treatment schedule (at week 0 and 4, then every 8 weeks) and administration by a healthcare provider. 1. Mayo Clinic. Ankylosing spondylitis. www.mayoclinic.org/diseases-conditions/ankylosing-spondylitis/symptoms-causes/syc-20354808. Accessed February 1, 2018. 2. Reveille JD. Epidemiology of spondyloarthritis in North America. Am J Med Sci. 2011;341:284-286. 3. National Psoriasis Foundation. What is psoriatic arthritis? June 2017. www.psoriasis.org/sites/default/files/psoriatic_arthritis_fact_sheet_1.pdf. Accessed February 3, 2018. 4. Mayo Clinic. Psoriatic arthritis. www.mayoclinic.org/diseases-conditions/psoriatic-arthritis/diagnosis-treatment/drc-20354081. Accessed February 5, 2018. 5. Johnson & Johnson. Janssen receives two U.S. FDA approvals for Simponi Aria (golimumab) for the treatment of adults with active psoriatic arthritis or active ankylosing spondylitis. October 20, 2017. www.jnj.com/media-center/press-releases/janssen-receives-two-us-fda-approvals-for-simponi-aria-golimumab-­for-the-treatment-of-adults-with-active-psoriatic-arthritis-or-active-ankylosing-­spondylitis. Accessed February 1, 2018. 6. Johnson & Johnson. Simponi Aria (golimumab) for infusion receives FDA approval for treatment of moderately to severely active rheumatoid arthritis. July 18, 2013. www.jnj.com/media-center/press-releases/simponi-aria-golimumab-­for-infusion-receives-fda-approval-for-treatment-of-moderately-to-severely-­active-rheumatoid-arthritis. Accessed March 5, 2018. 7. Simponi Aria (golimumab) injection [prescribing information]. Horsham, PA: Janssen Biotech; February 2018. 8. Kavanaugh A, Husni ME, Harrison DD, et al. 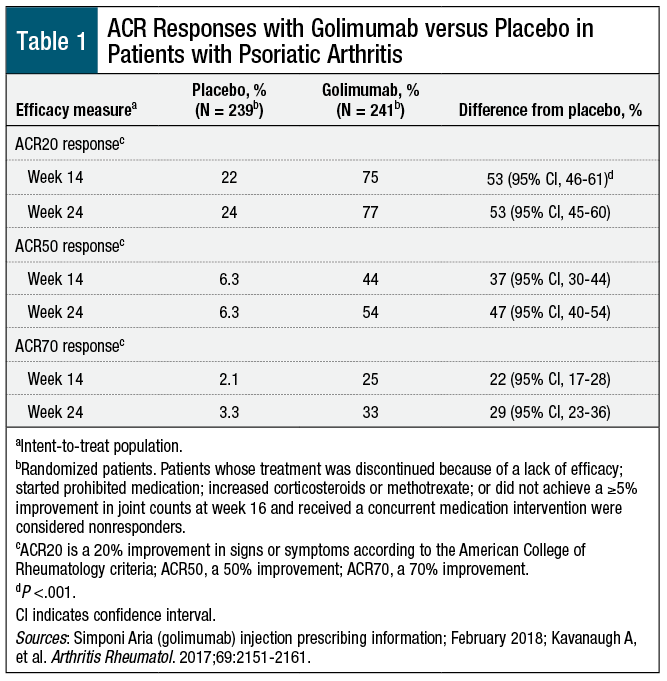 Safety and efficacy of intravenous golimumab in patients with active psoriatic arthritis: results through week twenty-four of the GO-VIBRANT study. Arthritis Rheumatol. 2017;69:2151-2161. 9. Deodhar A, Reveille JD, Harrison DD, et al. 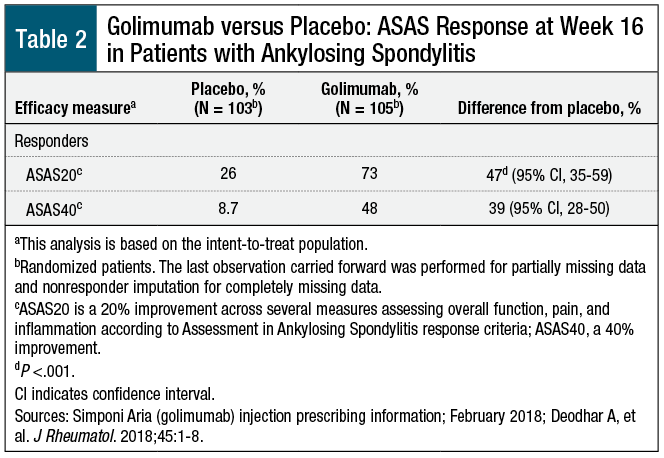 Safety and efficacy of golimu­mab administered intravenously in adults with ankylosing spondylitis: results through week 28 of the GO-ALIVE study. J Rheumatol. 2018;45:1-8. Erratum in: J Rheumatol. 2018;45:291.